Operating on Real Time Gaming Casino software, Aladdin's Gold Casino is able to offer one of the most advanced online casino platforms available. Aladdin's Gold is the newest casino from the Club World Casinos group, which is known for its integrity, security, and outstanding customer service. These people know how to please gamblers, as evidenced by their casinos' consistently high payouts, generous bonuses, and all-around user-friendly interface. New players at Aladdin's Gold Casino will benefit from three different welcome bonuses (variable according to coupon code). The casino's first bonus promotion is a 100% match bonus, up to $150 free. This bonus can actually increase to as much as a 100% match, up to $500 free if you choose to play the casino's slots games. The second bonus promotion is a 75% match, up to $200 free, while the third is a 50% match, once again up to $200 free. If you're the type of player that likes to sample the goods, then Aladdin's Gold has just the deal for you. Use coupon code BONUSRAT15 to get $15 absolutely free, simply for signing up! That's right, you won't have to deposit a single penny to cash in on this promotional offer. You'll get $15 free, and any winnings are yours to keep! On top of all of these welcome bonuses, Aladdin's Gold also offers weekly promotions, comp points, and an excellent VIP rewards program. Aladdin's Gold offers the full range of over 100 Real Time Gaming Casino games, each beaming with the latest visual and audio technologies. With its giant variety of table games, specialty games, video poker, slots games and progressive jackpot games, Aladdin's Gold Casino has something for everyone. Popular table games include: American and European Roulette, Baccarat, War, Blackjack, Multi-Hand Blackjack, Sic Bo, Keno, Craps, Red Dog, Caribbean Stud Poker, Pai Gow Poker and much more. A few of Aladdin's Gold's popular video poker titles are: Aces & Faces, Deuces Wild, Mystery Bonus Poker, All American, Pick 'Em Poker, Jacks or Better, Joker Poker, and many others. If slot machines are your vice, then you'll certainly be impressed with Aladdin's Gold Casino's variety, including favorites such as: Achilles, Derby Dollars, Food Fight, Cleopatra's Gold, Triple 7 Inferno, Penguin Power, Aladdin's Wishes and many others. As a Real Time Gaming Casino, Aladdin's Gold welcomes players from all over the world, including the United States. To play an online casino unlike any other, download Aladdin's Gold Casino's free software, or play at its no-download casino right now! 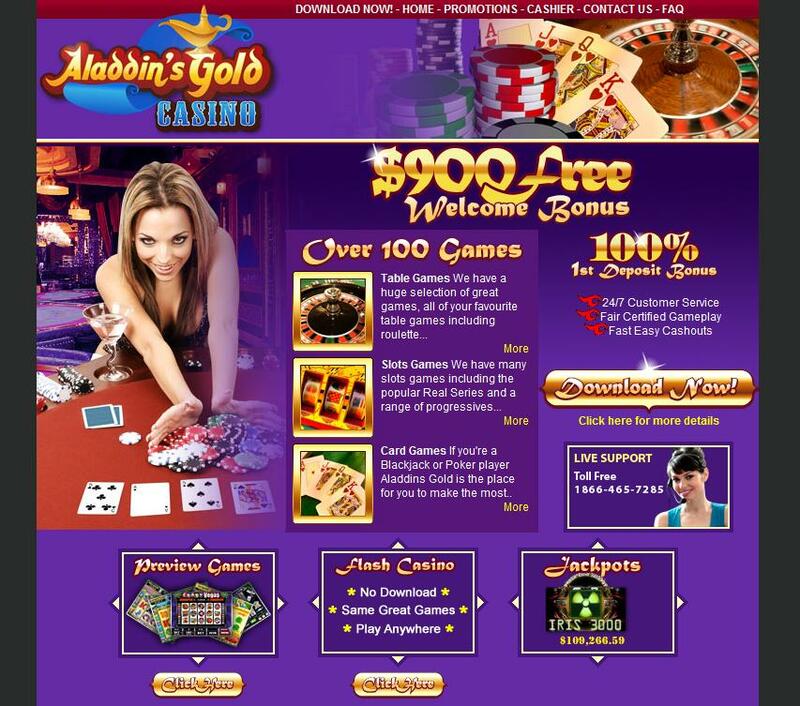 Visit the Aladdin's Gold Casino website.